A gunman killed three people before police shot him dead in the same town that played host to a violent massacre at a cinema last year. 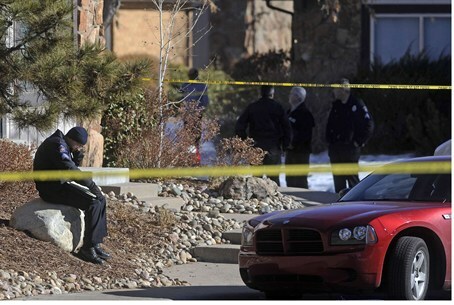 A gunman killed three people before police shot him dead Saturday in a shooting at a house in the Colorado town of Aurora, the same town that played host to a massacre at a cinema last year, police said. NBC television's local affiliate KUSA cited police as saying that one survivor escaped from the house, where an "armed and dangerous" man had earlier barricaded himself inside with hostages, AFP reported. "The barricade situation is resolved. The suspect is dead. There were also three other victims found dead inside," the Aurora Police Department announced on its official Twitter account. Aurora made global headlines in July 2012 after a horrific shooting at a movie theater left 12 people dead and 58 others wounded during the first midnight screening of the latest Batman film, "The Dark Knight Rises." On Saturday, several homes were evacuated and roads were closed for safety reasons before the gunman was shot by police, KUSA reported. The Aurora cinema shooting revived America's perennial gun control debate, a dispute that only intensified last month when a gunman attacked a Connecticut elementary school and killed 20 young children and six staff members.